Fiona Bruce and the Antiques Roadshow team make a return visit to Tewkesbury Abbey in Gloucestershire to uncover more treasures. Browse content similar to Tewkesbury Abbey 2. Check below for episodes and series from the same categories and more! a bloody conflict and a war of words. Welcome to Tewkesbury Abbey in Gloucestershire. On 4th May 1471, the Abbot was celebrating Mass here as usual. one of the most decisive of the Wars of the Roses. and Lancastrian troops rushed in seeking sanctuary. The Abbot was all that stood between them. he managed to restore calm and avoid bloodshed within the abbey. But it was only a temporary reprieve for the Lancastrian soldiers. They were executed a couple of days later. that our military experts would love to get their hands on. believed to be from the horses' armour during the battle. And it's all covered in little holes. caused by the arrow piercing the horses' armour. It's a wonderful old door, isn't it? A case of medieval recycling, if you like. And security was clearly a concern in those days. was coming in and stealing the church silver. Not all the abbey's treasures were so easily protected, though. the abbey still retained its precious medieval features. to what he thought it ought to look like. but they were overshadowed by some real howlers. to remove images from the Bible. It was thought that they were unsightly and a later addition. In fact, they were original artworks dating from the 13th century. The restoration provoked a high-profile war of words. was outraged and publicly rubbished the project. as a result of what he saw as the desecration of historic sites. the abbey is still a beautiful place to visit today. though no-one knows where it came from. Maybe our experts can shed some light on it. outside in the abbey's Pageant Meadow. in your family as "The Impressionist". How did it come into your family? Well, I don't know, maybe my father bought it. with the sun shining straight on it, and it looks so beautiful. because this is a snow scene, I think. So it seems to be a French village or the outskirts of the village. Date-wise it seems to be early 20th century. and Impressionism is what this is really all about. It was the artistic equivalent of splitting the atom. approached subject matter in a completely different way. you can see these curly strokes. and this is something that Monet was so good at. has clearly looked at Monet. and you've tried to work out what it says. but this one is a little bit more readable than one might imagine. The artist is Gustave Loiseau. just as the sun is now. as those artists. But nonetheless, he's learnt the language. an artist who is a second-rate Impressionist. We know, for example, this artist was born in the late 19th century. -Oh, he was a decorator? -He was a decorator to start with. -And perhaps one can see a bit of that, do you think? A bit of dragging and rolling? was in need of a lick of paint. you could add a few noughts here. it's still worth between about £10,000-£15,000. Well, that's very good news, thank you. You would have pines, symbolic of long life, or resistance to winter. or scattered about in here. Do you have any history with this? and effectively escaped after the war. and they were as poor as church mice. I mean, they wouldn't have spent any money on this. -More than any of the others? and they collected bits and bobs. Do you know what she liked about it? She loved the detail. And, in fact, that's exactly what I love about it. and find another little scene and think, "It's so pretty." where you're just using some little tools and eyesight. The date is actually fairly difficult. -but I don't think it is. and it would have come onto the secondary market when she bought it. -Do you know what it's made of? No idea, and this is one of the reasons we came today. OK, what it looks like is jade. -..but I felt it was too soft for that. -And it is in fact soapstone, not jade. -and this one is very jade-like. I've never seen a better soapstone mountain. -Oh, it's lovely to hear. It could do with a bit of cleaning. -Who's in charge of that? -I think it's a lovely thing. I think one would probably put £1,500-£2,000. I mean, it's a treat to hear that. For me, it just gives me a massive amount of pleasure. as my mum did as well. given by the town of West Cowes. loveliest silver mirror I've ever seen on the Roadshow. Where on earth did you get it from? between five and six years ago. and I thought, "I've got to get it." it never sold and I purchased it after the auction. Right, OK. Well, let's look at the mirror in general. We've got the Royal Arms at the top. who was her husband when they got married in 1885. She was 28 years old when she got married. but Queen Victoria refused to let her get married. for the rest of Victoria's life. it's got a date letter for 1885. Judah Rosenthal and Samuel Jacob. Now, I don't think I've had a piece by those makers ever before. So I'm sure this, well, it had to be a special commission. And part of that dressing table service would have been a mirror. can you imagine the faces that have looked into this? -Queen Victoria herself probably looked in this very mirror. I mean, it conjures up wonderful imagery. But we need to now go back to what you paid for it. ..if it came up at auction, would make £8,000-£10,000. Crikey! I never expected that. Should I call them boring or not? Really, they're just graduation photographs, aren't they? so did you bring these from the States with you? No, no. I bought them at a car-boot sale, of all places, in Cheltenham. And what drew you to them? Well, I saw these two old photos just sitting there. so I took a closer look and they were signed by Dorothy Alexander. and I suspect that obviously meant something to you, didn't it? -as a matter of fact. because she is in fact an incredibly famous photographer, isn't she? are two very early examples of her portraiture. as the doyen of the British photography scene. I mean, she's quite old now, but she was a very, very interesting lady. and came over to the UK and became a post-war photographer, didn't she? -So, how much did you pay for them? -The frames are worth more than that, aren't they?! extremely well to spot them, well done. -All right, then, thank you. I got it from a charity shop. There were four of them that the man was putting up. cos I thought they were going to be more than I could afford to pay. -And so I said, "How much are they?" and the woman said, "20 quid?" -And here we've got an original watercolour. and I think they're worth £4,000-£6,000. a pair of textile hangings. that William Morris had a relationship with Tewkesbury Abbey. so if anybody knows you should know, so please tell me. by Gilbert Scott for the restoration of the abbey. but they've been here for quite a long time. some time between 1893 and 1899. Now, saying that, this presumably is that image. -So it's behind the high altar. And these are the hangings either side of the crucifix, correct? So, let's talk a little bit about this design. I mean, the bird pattern started in 1877.
that he actually used it to decorate his country house, Kelmscott Manor. he was running Morris & Co, which was a commercial interior designers. So this was one of his popular designs. to the tips of his fingers, trying to get the exact, correct colour. Now, the passion for Morris designs goes on unabated. they went on until the 1940s. -I think so, yes, yes. Everybody will be very pleased to hear that. listening very intensely to the wireless. And we've got written on there, "Not passed, adjutant general." Well, I got this from my uncle who passed away a number of years ago. his eyesight wasn't good enough, so he became a radio operator. all over Europe. When I was clearing out, I found this sketch. there's a big blue cross on there, "Not passed", so it was confiscated. Now, how my uncle got hold of it, I don't know. There's a civvy one there as well, probably for a bit of light music. -They properly had the Light Programme on. "more than that I can't say," so I wonder why they were so secretive. in fake hay bunkers, lofts. -All over the place, like. if you've got two or three people who wanted to fight you over it. I think it's just great that you've saved it. with one of my favourite factories, Poole Pottery. very same pots. So, what's the connection here? -My mother worked for Poole Pottery as a paintress. She painted from 1926 to 1936.
and took her first job, which was at Poole Pottery. and one painted by a colleague of hers. -when she was a painter at Poole? Doris Marshall, I know it, yes, of course! -but this is your mum's work, then? and Doris Atkins was her married name. which is probably the best of the very many pieces I have of hers. Within the family we have a significant number of other pieces. My daughter and my son and my brother all have pieces. they are all very easily identifiable. and I know that that is your mum's paintress cipher, then. That's her little moniker on the bottom of every piece. And actually, this one has, of course, a different series of marks. so there's a very brief overlap. because of the combination of marks, paintress pattern, is a 1934 piece. was given as a gift, maybe a late leaving present. and can I really put a value on your mum's work? between £80 and £120, £150 for these. This piece is a bit more of a show stopper. to show off the work that the factory were producing. It's a great pattern, good artist, good date, good period. It's got all those nice box-tickers that you want. for me, of £400, maybe £500. But the painting, I just love that. This, for me, steps away into a different market. maybe £500, even £800 for that painting. I am just one step away from a lady who painted the work I love. Andy Warhol, and it's Chairman Mao. in New York, and, you know, he was the top of his tree. by Andy Warhol to Caroline. So tell me about it. How did you get this? and the name of that woman was Amy Sullivan. amongst the Marvel Comics empire. and hang out with Andy Warhol. "shall we bring you something back?" And this was one that was signed to me. and my sister Sue has one, which is the blue and yellow cow. which has since obviously disappeared and gone its own way. Well, I think this is all pretty cool. But it is in a bit of a state. -I mean, we've got roll marks here. that my sister didn't want. Then when she realised it said "to Caroline"
And I think it's amazing to have got this back from that period. And as a present for you, it's wonderful. I can take a guess that it's worth £3,000 to £5,000. You've brought along an absolutely cracking Arts and Crafts bowl. Very good weight, lovely condition. I suspect you might have an idea who made it. It was made by Omar Ramsden. and volunteered to join the Artists Rifles. -..that's inscribed in the centre here? -OK, let's turn it over and we can have a look at the marks. ..by Ramsden and his original partner, Alwyn Carr. and then came to London and set up business. Omar Ramsden and Alwyn Carr made me. he's made it on seven feet. but Ramsden liked to do things differently. is the badge in the middle. And you referred to the Artists Rifles. because of the threat of invasion by Napoleon III. "Come on, let's form a volunteer company,"
and it took off and became really popular. And during the First World War they had a very distinguished record. one of the makers with Ramsden, signed up for the Artists Rifles. between the maker and the recipient like that. to survive the First World War. So, lovely piece of silver. ..the commercial world of silver any favours. I think it would make easily between £2,000 and £3,000. Well, I mean, it's lovely. I saw the boys bringing this in, big, hefty lads. This is a piece of furniture which carries some weight. So, where do you keep this? So, this is kept in the entrance hall to a local hotel pub. It's been there forever and a day, we think. and we've got Tudor parts as well, Georgian parts. or anything about it, really. So, how do you use it in the pub, then? So, this is in the main entrance. table talkers in the drawers, so it's still very much used. It's just there for everyone to enjoy, really. -And how do you clean it? and that's something we were hoping you could probably tell us. Is that a very polite way of saying you've never cleaned it? yeah, not much goes on with the table. -you've got this wonderful what I call toffee colour. -..and just, you buff it up. will literally make this whole table sing. So we've got these wonderful Tudor legs. that, you know, this is a really good thing. The wood. Any idea, what do you think the wood may be? -Cos it looks really heavy. Is it oak? Is it, no? -It's actually better than oak. -Walnut, oh! There we go. -so it is very, very old. And being made of walnut, it makes it even more exciting. Yes, yeah, we thought it may be quite valuable. -I can see this in a very modern environment. And it could look so sharp, so sharp. Well, I think this is a great piece of English furniture. I love the condition. I would leave it alone. Well, I'd put a value on it between £15,000 and £20,000. Going to lock it to the wall now so it doesn't go anywhere! So, here we are in the back of your dad's milk van. And they would come out with a jug to be filled by your dad. her daughter, Doreen, was getting married that day at the abbey. And it was pouring with rain. So he jokingly said, "Would you like me to take you to the abbey?" Was she going to walk, otherwise? She was going to walk, yes, of course, and get wet. and she sat in the front of the van and he took her to the abbey. and then he accompanied her to meet the bridegroom in the abbey. -He took her down the aisle? -He took her down the aisle as well. Whoa! Was he still in his milkman's uniform? No, I assume he dressed up! to go to the reception. And then he got invited to the reception as well. Well, he had a starring role! I should hope so, too. But he was a lovely man, my dad. you bring along this collection. Now, tell me about it. and he brought a lot of Maundy money and then built up the set. and it's actually one of the things which I love. Do you know much about the history of Maundy money? and giving of oneself to another. it's basically showing love to someone else. "No, I've had enough of washing stinky people's feet. when they changed that into giving of coins. The cases are in pretty good condition. put on there, it's really not good. There's a family story behind that. and stick them all over his office so he would know where she'd been. "because she put it on there for him to find." So you've never tried to remove it? because it looks like someone's tried to stick it down. But now, never move that. That's all right. It's forgiven. Now, what made him go for Maundy money? but he developed it and it became a real passion of his. Over about seven or eight years. That's quite quick to build up a collection like this. Because basically they start in, well, 1676.
of when they sort of started. And you go through to the last date of...? and we continued collecting for a couple of years after that. I sort of counted out 63 odd coins in that tray. Some had three or four coins, but there's a lot in there. And, well, it's really all I can say. -of Maundy money like it. These could be worth sort of £30 to £40 to £50 each. -Yes, thank you very much. -That's really great, thank you. their glaze just glinting in the sunlight here. about the turn of the century, and they're as large as I've ever seen. Yes, the size is certainly amazing, isn't it? They're incredibly big. there's the impressed Doulton mark. And they were made in Lambeth and they were made about 1900. -I agree with all that. -which is what we call impasto decoration. is incredibly detailed and beautiful. I've got so much admiration for that work, I want to know who did it. You've looked it up? Oh, thank goodness! Yes, and it says that it's by an artist called Frances Linnell. and the results of her work were absolutely stunning. So, can you tell me how you got them? and I was very surprised when I got them. was more than I'd actually paid for them. "put them back through the next sale,"
and so I got them. and not read the description very well, either. -they're more like 18 inches. -plus the auction house's costs. of having them shipped to you, as well. Because that was going to be over another £100, yes. Oh, so they were going to cost you 250 quid. over a pair of vases worth £1,000. How have you come to get hold of it? And eventually I plucked up the courage and went and bought it. Good for you. So it was obviously meant to be. -Date-wise, it dates from the 1860s. or hallmarked as Victorian jewellery didn't have to be during that time. we have a brooch pin which probably would have been fitted later. which would have been for a bracelet fitting. Oh, I did wonder whether it was part of something else. Right. I'm glad I didn't have the bracelet! Well, yes, I'd kind of agree. I think human hair is very personal. It's about the memory of somebody that you might have lost and loved. in the Victorian period was really important. So, having fallen in love with it, do you wear it? But it's not something you can wear every day. -Well, I don't know about that! -I wouldn't wear it to work. and I think it's absolutely adorable. a brooch like this would be between £5,000 and £7,000. Well, I'm happy that you're happy. -Pleasure. Thank you for bringing it in. but it's lovely to have an in-between medium, pastel. a book on the French pastellers. holding a monkey in her arms. It's in the Louvre. to introduce to the French artists of the time. And how much did you pay for her? as you hope, but have yet to prove? -And wouldn't it be wonderful if we could? in the late 17th and early 18th century. towards doing pastels, went to France. I mean, she was a woman who turned heads, and so did her portraits. lips and nose are done. There's a real sensitivity to them. If you touch the surface, you end up with it on your finger. Look at the blue round the shoulders. I mean, that has undoubtedly faded. and I'm going to give you an opinion. you DID buy a work by Rosalba Carriera. are the sort of things that people want. of its condition, I would say this is worth £10,000-£15,000. Well, that confirms, I think, my hope that it was by Rosalba. you look at it and it's, to me, so Heath Robinson. then putting the top on, what we call the hood. Well, we noticed it's inscribed on both sides. Of all the initials in the world on a commode, we've got WC! But I think someone's put that there. It's the way it's been executed. So, tell me your story about it. and my auntie said it had to stay within the house. And... So obviously we bought it. as a part of the house. It's made of oak and elm. it's got all the soot and everything from the fire. so you can see the natural colour of the wood itself. And this, this is obviously to help get the little potty out. But it looks much, much older. if this ever did come on the market. at least £1,500, possibly £2,000 for this. Thank you for bringing it along. That is a pleasure to see. And, yeah, if you see another one, let us know. into the grounds of the abbey. that has ever been brought into the Roadshow! Where has it been living for the last 150 years? after he finished playing with it. So it's not been played with for 60 years? "you should take it in and let them have a look at it." -So that was when you were 12. And you're a bit more than 12 now, so that was some time ago. -and still haven't brought it until today. It was treated with reverence, so we weren't allowed near it. so it's sort of been up there. -you would've played with it and you would have broken it! That's what's nice about it. And in fact, the dirt has preserved it. Well, I believe it's German, but I'm not sure. or my great-great-grandfather's, but once again I can't be sure. And the family have always lived in the same house? and we've been in the same house since 1864. Well, great provenance, great history, great original condition. So, I can confirm it is German. and I assume the costume is too. and the little legs would go up and down. and he's got metal hands and wooden feet. The mechanism and the tricycle part of it I think is made in France. to produce what is, I think, a wonderful toy. ..if we just go back down the generations. Well, I think it is nice. that every collector wants to find. I think it could easily fetch between, well, £2,000 and £3,000. So congratulations for not looking after your toys! a woman walking through the abbey meadows. It's wonderful. Is it a family heirloom? later on to dress up in it. And did your daughter dress up in it? No, no, it's never been touched. -I've never seen it out. -You've never seen it out? -This is the first time you've actually seen it? Yes, seen it on show, yeah. -How do you think it looks? How have you kept it? In a box, or...? Just in a box, or in a drawer, yeah. Well, let's talk about what it is. "Oh, obviously it's incomplete. It's got an open front." We call them a petticoat, but it was an underskirt, really, under it. ..to give you that wonderful silhouette. and you would have seen shadows down the side of the dress. It would have been quite extraordinary. Yes, it would have been wonderful, I should think. The material that it's made from is really quite exquisite. to be made up into this dress here in England. The decorations on it are also rather wonderful. They're little sort of dangling tassels of chenille work. which have got a little piece of wool inside. -It looks almost like a piece of cotton wool. to give it a three-dimensional view. I'm just going to turn it round, if I may. which is a sack-back robe. which gives it a sort of train effect. you were making really quite a statement, as you can imagine. I think so, yeah. It's beautiful. and we can enjoy the front. What I also like very much are these scalloped edges. We've got scalloped edges, particularly on the sleeves here. one has to appreciate that this is an extraordinary survivor. which is what so often is the fate. It is an incredibly rare survivor. and who knows where it will ultimately end up? But this is for a major museum somewhere in the world. Don't tell my granddaughter that! Oh, dear, I can't believe that. And to think the dress has just been sitting in a drawer for decades! that's reminded us of Antiques Roadshows past. Have you ever seen a penknife quite this large? made of staghorn. Look at this. absolutely fell in love with it. that could be worth £1,500. 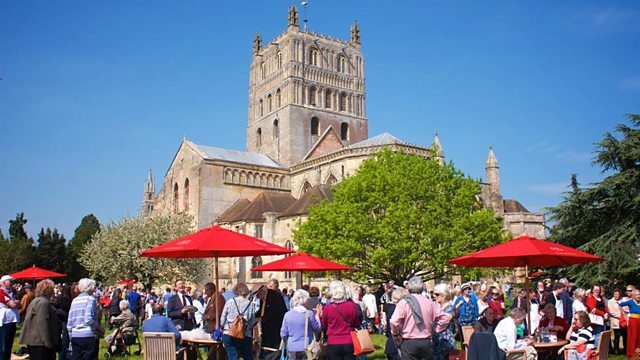 Fiona Bruce and the Antiques Roadshow team make a return visit to Tewkesbury Abbey in Gloucestershire to uncover more treasures. Amongst the objects featured are an extremely heavy Tudor table from a local pub that takes six sturdy men to move, an extensive collection of Maundy money that excites expert John Foster, and a signed picture of Chairman Mao by Andy Warhol. Hilary Kay is thrilled to see an incredibly rare and valuable 18th-century painted silk dress which has been lying in a dressing up box for over 50 years.